Here is where you can find everything you need to design your own custom rosary. You choose your favorite beads, center, crucifix, wire/chain, and charm and I'll put it together for you. Please keep in mind that inventory is changing all the time (especially with stone beads). Don't hesitate to contact me if you are looking for special beads or are just curious to see what I have on hand currently. Also, the items in this section are for custom rosaries only and not for individual sale. 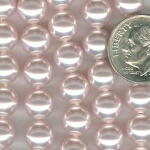 For individual items, please check the individual rosary part section, loose bead section, etc. 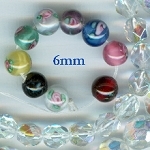 Choose from a wonderful selection of Czech glass beads to make your custom rosary unique! 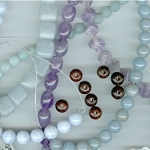 Choose from a wonderful selection of stone or wood beads to make your custom rosary special. Do you love the sparkle of crystal? 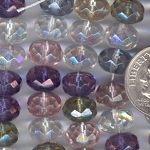 Check out the wonderful Swarovski crystal options available to make your custom rosary unique. Make your custom rosary special by choosing your favorite rosary center from a variety of finishes and prices. Make your custom rosary special by choosing your favorite crucifix from a variety of finishes. Make your custom rosary special by choosing the perfect matching crucifix and center combo. Make the"Our Father" beads on your custom rosary stand out by using a larger size bead or even stone. Add a special touch to your custom rosary by attaching a special medal or charm to your crucifix or centerpiece. Availability changes all the time. 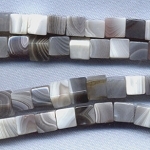 Take a peek at some great stone filler options you can use to add a unique touch to your custom Speziale rosary.